Each day 360,000 babies are born in every corner of the world, from the wilds of Africa to the hospitals of Australia. And with each birth comes fascinating birth traditions, passed on from generation to generation. Rituals to ward off evil and illness, rituals to welcome a new soul onto the earth, rituals to strengthen new mothers for the journey ahead. 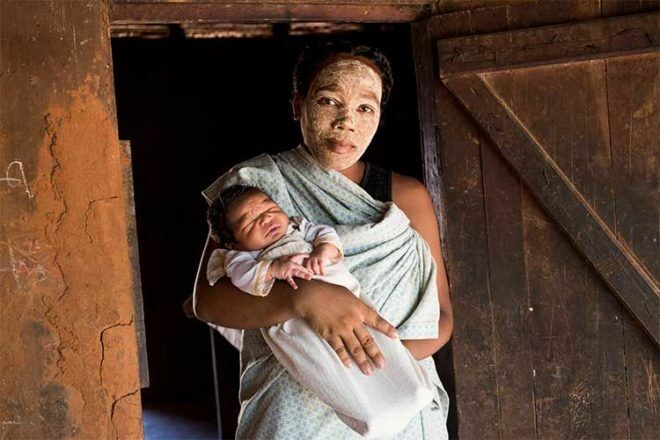 WaterAid, which provides clean water, decent toilets and hygiene knowledge to people who don’t have access to them across the world, has released an incredible series of photos and stories documenting birth rituals around the world. The hope is that we’ll pause and think about the many women around the world who give birth without access to clean water. Here is what the all-important post-birth period looks like across the globe. 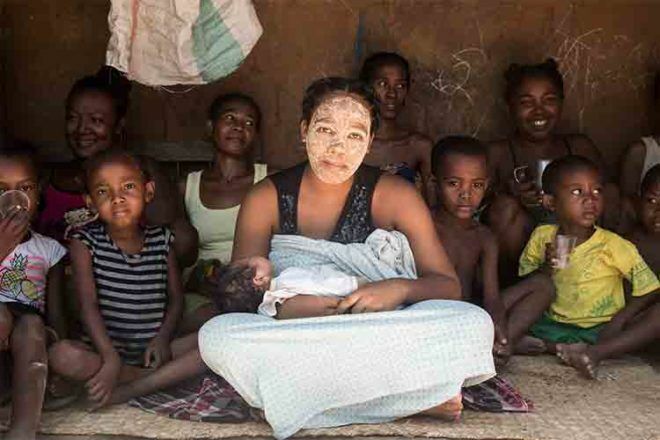 New mum, 21-year-old Nome wears a ‘masonjoany’ mask to protect her from the sun and bad spirits. The paste is made from grinding a sandlewood tree branch and adding water. It’s the first time Nome has been out of the house since giving birth seven days ago. 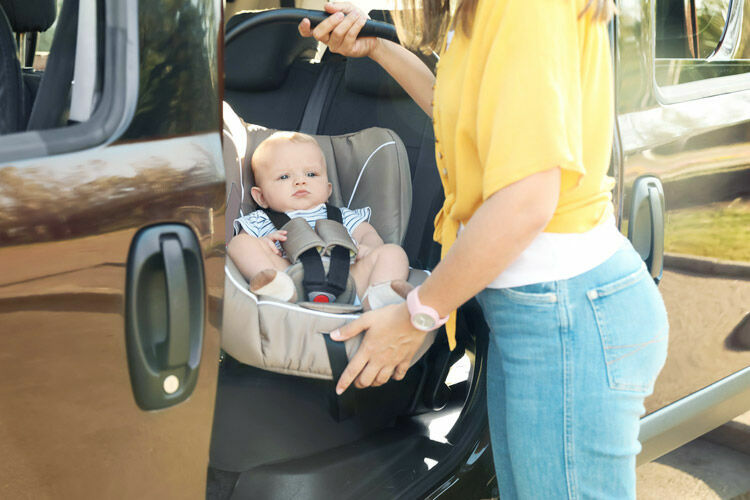 Nome explains, “In our culture, mothers like me and our newborn babies are not allowed to go outside during the first seven days after the birth. The mother is still suffering and the baby is still very fragile and at risk.But once we have made it through these sacred critical seven days we step outside for a short time to face the reality of life and the bright sun. And we celebrate this moment with our family members. “My older sister applied a ‘masonjoany’ mask to my face to protect it from the sun and from all bad spirits. When everything is ready, my baby and I step outside to the eastern side of the house and sit down. I don’t know when this tradition started, but I would say it has been happening ever since there have been people in Madagascar. The tradition says we should exit to the eastern side of the house because the east is where the sun rises, and the sun is life. WaterAid explains that Nome didn’t have time to go to the health centre so gave birth in her village, but she had been attending the centre during her pregnancy. The centre has a toilet but no running water, only a wall. Nome’s first son was born in 2016, but died in 2018 from a diarrhoeal disease. Indian mum Rinku, 22, puts thick kohl on her child’s eyes to ward off evil spirits. It’s applied onto the inner eyelid, or as a dot on the forehead. 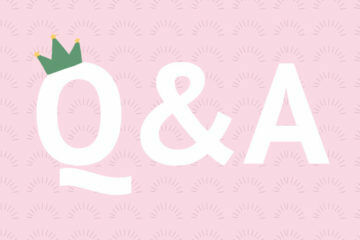 “We put kajal (kohl) on our children’s eyes or a dot on the side of their forehead. It is a thick black paste traditionally used in India, Egypt and Middle Eastern countries. In earlier times, the mixture for kajal was made at home, but today people generally purchase kajal from cosmetic shops. Rinku had her baby in a government hospital in Delhi with toilets and water, and this was her second child. In the slum where she lives she has water from a groundwater system and most of her neighbours have toilets, while others use a community toilet centre. Rinku gave birth in a government hospital in Delhi where there were toilets and water. She has two children, including Kritika, age 2. 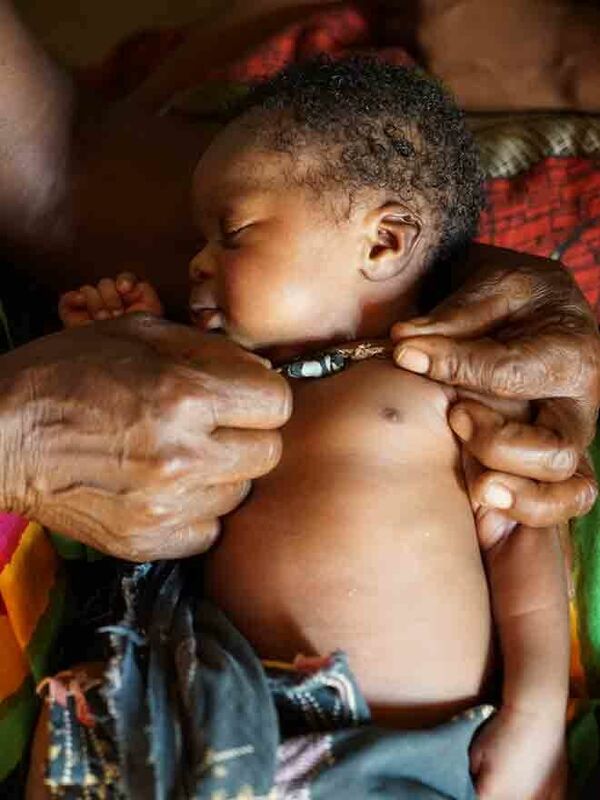 Gorgeous little Zambian two-week-old Mutuinta wears a ‘kakonde’ which is a protective necklace to stop her from vomiting, diarrhoea and bad omens. “The only ritual I can share with you is Kakonde, the protection necklace. This is tied around the baby’s neck immediately after birth. This necklace stays on the baby for up to nine months. The purpose of Kakonde is to protect my baby from vomiting, diarrhoea and from bad omens. If I don’t place this necklace on her, my baby will be sick most of the time. I will always keep this Kakonde necklace on Mutinta because I want her to grow up healthy and protected from any bad omens or spirits. Her mum Chuuma, 18, lives in Monze district, Zambia, and her her daughter in the local clinic, where she says the water and toilets aren’t adequate for pregnant women. This first food ceremony is a tradition that takes place when bub is 100 days old, and it’s purpose is to make sure baby never goes hungry in their life. 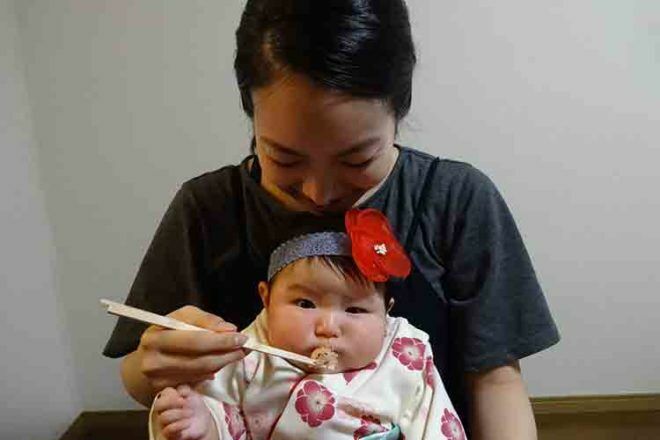 Natsumi explains, “When the baby is 100 days old we do the tradition of Okuizome at home or at a restaurant. The family prepares traditional dishes which each have a symbolic meaning and pretend to feed him or her for the first time. 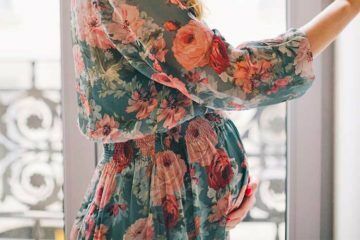 We wish that the baby will never starve throughout its life. Natsumi’s birth was in a general hospital in Japan which as clean water a good toilets. Ugandan mum Nagit sits at the doorway of her house after her baby’s blessing ceremony, where the skin of the Etopojjo tree is soaked in water and the strings are tied around the baby’s wrist, ankles, neck and waist. “There is a special tree called the ‘Etopojjo’,” Nagit explains, “Whose skin is soaked in water for about three hours. Small strings are made from the soft skin and tied around the baby wrist, ankles, neck and waist. The water used for soaking the Etopojjo tree skin is also poured into the animal enclosure. If the baby is a girl, this symbolises blessings for her to bring more cows back to the enclosure on her wedding day. “We have many birthing rituals and they have been performed for generations. After giving the baby a name, there is a continuous lighting of a fire in the house for four days. During this time the mother does not leave the house during the day, she waits until the evening. The day the baby’s umbilical cord falls off, it is collected together with ash from the four-day fire, mixed with water and is poured into the animal enclosure by the baby’s grandmother. “These are blessings for the baby; if it’s a baby girl, the ritual symbolises that, as the baby grows, she will bring more cows into the animal enclosure on her wedding day. For the boy, it means that he will be rich with many cows. After this ceremony, the baby’s mother is free to come out of the house and introduce the new baby to the waiting clan members. Through its work in Nagit’s region, WaterAid is educating local communities good personal hygiene, facial cleanliness and proper disposal of human waste as the most sustainable way of preventing trachoma by keeping flies away from homes. 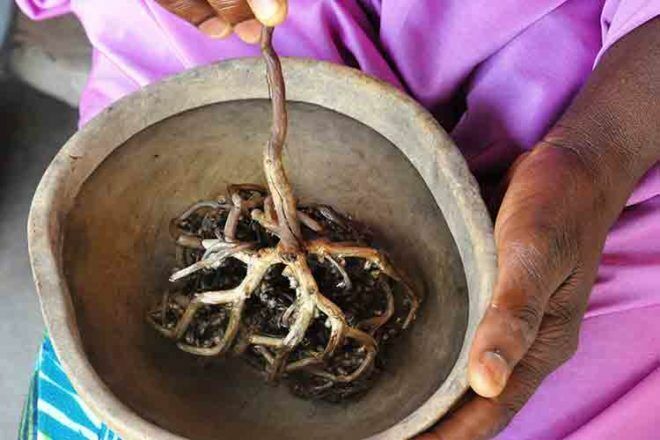 Part of the Nigerian tradition Nana Fatsuma involves dissolving a twig tree in a calabash bowl filled with water for a pregnant woman to drink to help labour along, and protect the unborn baby. The stick is named after Nana Fatsuma, a wife of the prophet Muhammed. Alti is a 40-year-old widow who’s had ten children, with only five still alive today. She explains, “When the woman is in severe labour we perform Nana Fatsuma. It is performed at home, near the delivery bed. A stick with twigs like fingers is inserted into a bowl of water and when it dissolves, the solution is given to the expectant woman to drink to hasten delivery. In a custom that’s meant to bring luck and prosperity, five-week-old Emma is given a coin by her grandmother in Scotland. “The coin was given to Emma by her Nana for good luck. It is a Scottish tradition. I definitely had coins put in my pram as a baby and I remember people doing it to my sister too when she was in the pram. Amanda gave birth had her second water birth at Princess Maternity Hospital in Glasgow. 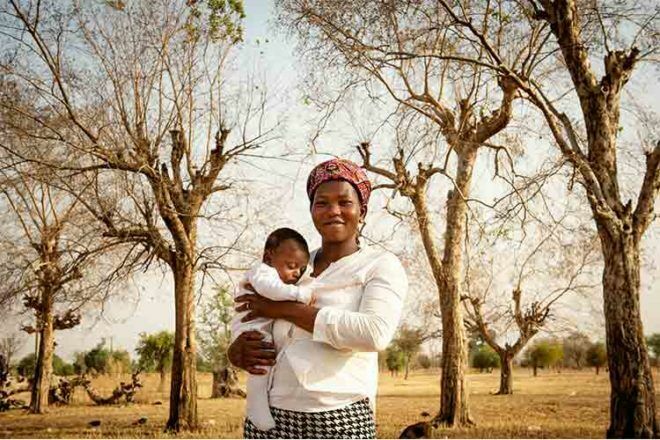 Vida is holding her one-month-old David in front of one of the trees that has its bark boiled in water and poured over her as part of Kosoto. It’s meant to protect her for tummy problems in future pregnancies. “For Kosoto, we take the bark from a certain tree and boil it in water,” Vida, 30, explains. “Then a female relative will pour the warm water over the woman, alternating it with cold water. They say that if you don’t complete Kosoto, you will get stomach pains during any future pregnancies. I’m not sure if it works, but it’s something that our ancestors always did, so we continue it. After the ceremony, the baby can be named. “I have four children, including David who is one-month-old. There were water and toilet facilities at the health centre for my most recent delivery, and the changes were significant. When I gave birth to my other children, I had to find a quiet place outside when I needed the toilet. 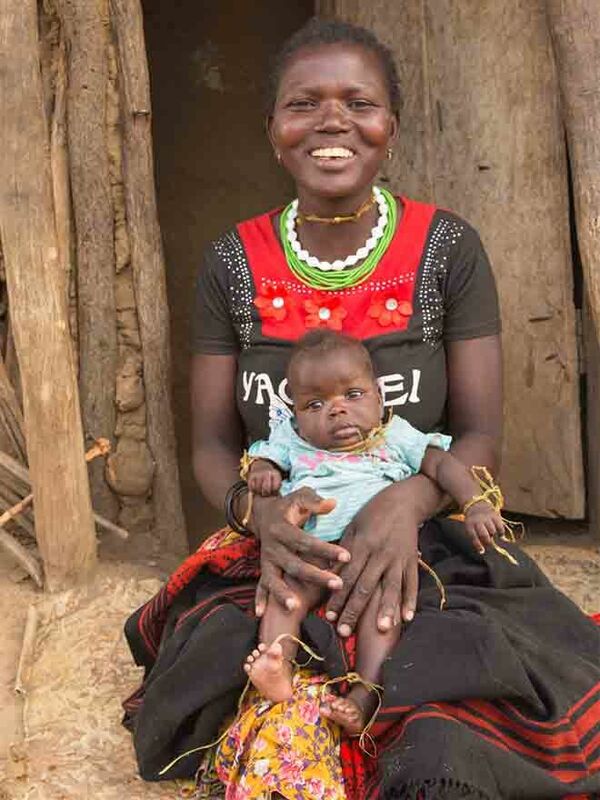 And after giving birth, there was nowhere to wash.
Vida gave birth to David in Busongo Community Health Centre in Ghana, which has had water facilities installed by WaterAid since her first two births. 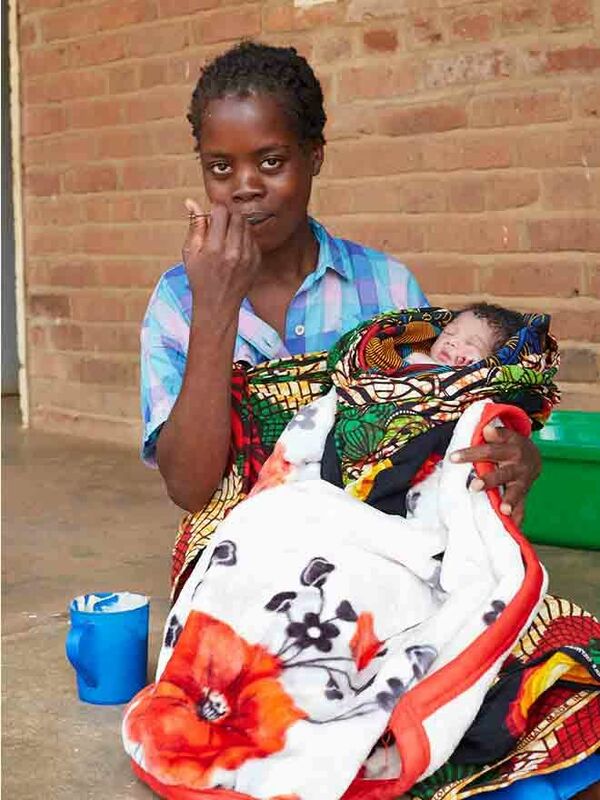 Lucia eats a postpartum porridge made from soy, maize flour and sugar after the birth of her baby. 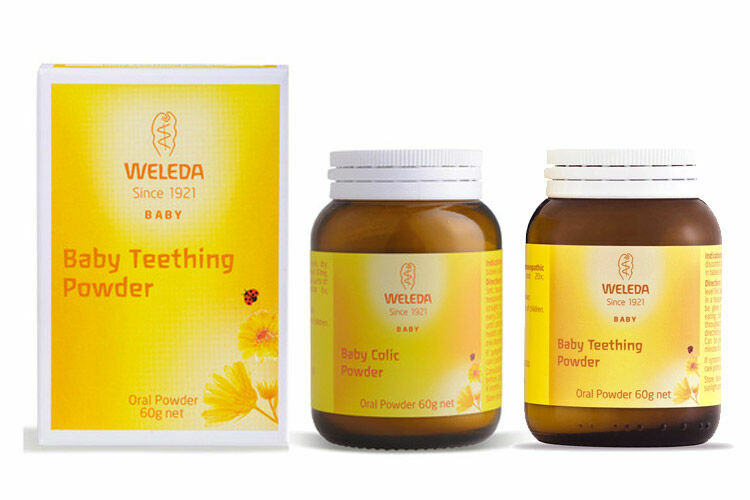 It’s meant to give new mums energy and nutrients. Lucia’s mum Melisa explains, “I will make the porridge for Lucia for one week, as it’s light and easy for her to eat with stomach pain. Each day, I will also give her a soft drink, and sometimes some bread. Baby Bertha was born at midnight last night, and every morning for the next week we will follow the routine we did this morning. I will prepare the special porridge for Lucia while she showers”. In 2015 there was no running water, proper toilets, clean bathrooms or safe waste disposal at the health centre where Lucia gave birth. Now the centre has water thanks to WaterAid’s funding. 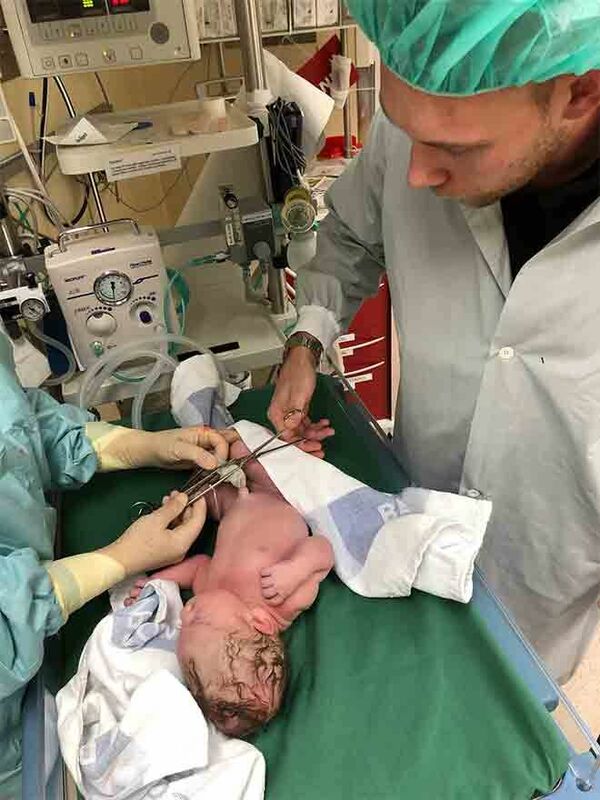 Dad Sebastian cuts the cord of his newborn son in an operating theatre in Sweden. Maria, mum to newborn Harry says, “When the baby is born the father usually cuts the umbilical cord before the baby is placed on the mother’s chest. Because this is a tradition, the father sees it as a big responsibility. The ritual is performed in the delivery room. In our case the cord cutting happened in the operating theatre as I had a cesarean. It is important that the medical instruments used are clean and sterilised which relies on clean water at the hospital. Four-month-old Emmeline is baptised at the Roman Catholic Holy Family Church in New Jersey. This ritual from the Catholic church stems from a belief that holy water absolves the baby of original sin. Mum Marissa says, “At the christening, Emmeline was blessed by a priest and had holy water poured on her head with parents, godparents, and the wider family present. After the ceremony is performed, the extended family and friends, 65 people in all, convened to share a meal and celebrate Emmeline’s life. The holy water was poured over her head by the priest as he blessed the baby, dissolving her of original sin.